Clients are not just a file number. They’re real people with real problems. Clients trust their lawyer to work hard for them, to understand their problem and to get a positive outcome for them. I take that responsibility very seriously and I am committed to working hard to achieve that outcome. Clients at my firm are not handed off to junior lawyers or legal assistants. I deal personally with all clientele from the beginning of the file to its conclusion. I highly recommend Jo-Anne to anyone who is currently separated from their spouse where children are involved. Jo-Anne was able to help me though that stressful time and help me accomplish what I needed to in court for my children. I would recommend Jo-Anne to anyone. We were extremely satisfied with the services we received from Jo-Anne Moore as our lawyer. She was very conscientious, extremely knowledgeable, and worked hard for us. We were confident in knowing she was always on top of each situation that occurred as she resolved our case. We would certainly use her services again should we ever need to. Jo-Anne Moore was recommended to me by one of her peers practicing in Miramichi City in 2012 when I was seeking a divorce from then husband. I subsequently retained Jo-Anne as my divorce lawyer and obtained my divorce in March 2013. During the divorce proceedings I was continually impressed by Jo-Anne's personable and efficient approach. While quickly grasping the suite of the situation, Jo-Anne led proceedings efficiently to a swift and amicable close between my former husband and I. In dealing with my former husband regarding the signing off of property, he found her gracious and approachable and her ability to deal neutrally and kindly with him was most dignified. All queries were answered swiftly and fully and I was fully informed at what was taking place at every step during proceedings. I commend Jo-Anne Moore's services without hesitation and consider myself fortunate that I was directed to her services at my time of need. I used the services of Jo-Anne Moore law Office to resolve a difficult and protracted separation agreement and divorce settlement. As a previous New Brunswick resident now living in British Columbia, I needed as skilled lawyer who I could trust to deal with the very personal nature of this issue from afar. Jo-Anne Moore and her team proved not only to be professional and efficient, but always acted with great tact over theses sensitive family matters. Jo-Anne knew exactly when a forceful forthright approach was needed and when compromise was warranted and advised me accordingly. I came to trust her sage advice explicitly. I was always kept well informed about the progress of my file and felt that Jo-Anne understood my position on various issues and always advised me on the best course of action to take. Engaging Jo-Anne proved to be one of the wisest decisions of my life allowing me to bring a fair and equitable conclusion to a very difficult situation. Thanks to Jo-Anne I can finally close one chapter of my life and move readily into another. I highly recommend Jo-Anne to anyone who I know is going through a separation or divorce. She is very knowledgeable, detailed, thorough, and gets the job done! She explains every part of the process and makes you feel confident that everything will be taken care of. Jo-Anne is a pleasure to deal with and I wouldn't hesitate to recommend her to anyone. Jo-Anne was invaluable to me at a very difficult time of my life. She walked me through over a year of back and forth dealings in Court with a lot of patience and compassion. She was very knowledgeable and answered all my questions no matter how trivial. Jo-Anne offers a vast wealth of knowledge and experience. I was more than satisfied and felt so blessed to have someone with so many exceptional qualities! I am so thankful for having come across her name. I have seen a few lawyers and Jo-Anne is definitely the best! Jo-Anne is very understanding of your situation as she does a great job being there for you while responding to questions promptly, thoroughly, and with excellent knowledge. I am proud to have had her as a lawyer and she would be my first recommendation to anyone. I would highly recommend Jo-Anne Moore to represent any person in need of legal services. 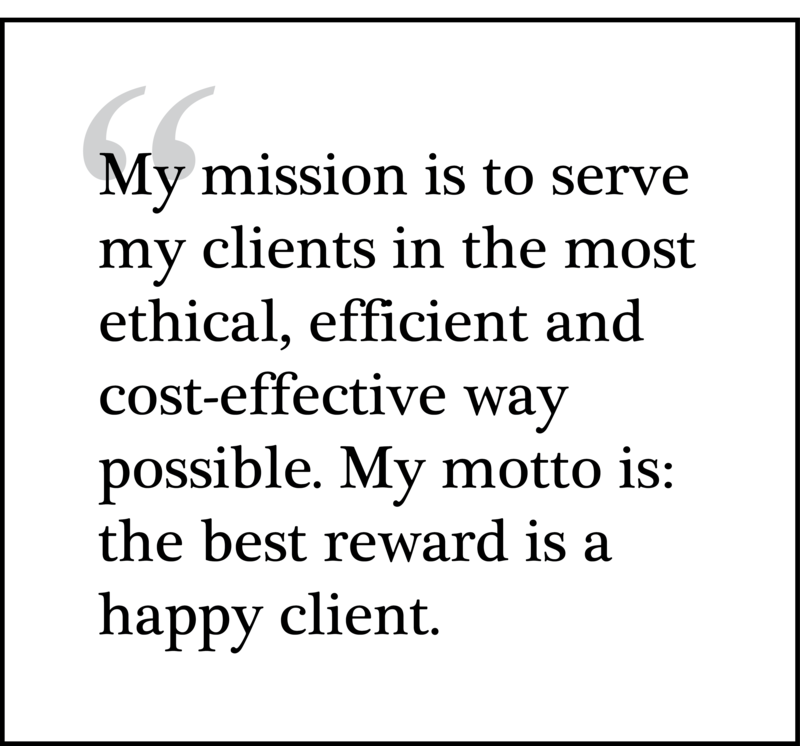 Jo-Anne works to ensure that the scope of her legal work stays consistent with the client's expectations and budget. Jo-Anne realizes that many of a lawyer's future clients come from existing clients, and she seeks to make her clients satisfied with her services. Jo-Anne listens to the client and really understands what the client wants and needs, and works within that framework. Jo-Anne is happy to discuss subject of cost upfront, and likes to make sure that the client understands and is comfortable with the fee structure she and the client settle upon in advance. As in any service business, you can find lawyers with rates lower, and with rates higher. One of the major advantages from a large law firm to solo practice is that, by keeping overhead down, Jo-Anne can bill at rates which clients find more appealing, while giving the excellent service and providing the experience they seek. I am certain that the value and efficiency Jo-Anne provides to her clients support her fees and that her fees reasonably reflect what clients should expect to pay for the services of a lawyer of this caliber. On a personal note, Jo-Anne's dedication, concern and interest in all the legal services she provided to me as a client were very much appreciated. In summary, you have earned my most enthusiastic recommendation. During unfamiliar times we all need reassurance, we want details, and lots of explanations. Anyone new to legal proceedings would feel overwhelmed. Jo-Anne Moore was exceptional at making things understandable and making sure I was comfortable. She was clear and to the point about legal processes and court. What to expect and the process that would be followed was explained in a way I was 100% comfortable. What I loved most, was her honesty. Instead of giving me false hope, she was very honest and straightforward with all of the possible scenarios. My entire experience with Jo-Anne was pleasant. She is extremely easy to talk to and was always prompt in returning my emails and calls, which was very important to me. She always made sure I felt at ease and didn’t leave me worrying. A very empathetic and knowledgeable lawyer. I would highly recommend her services. I recently retained Ms. Moore to prepare my will. She not only provided excellent legal services in a timely fashion, but also gave good recommendations. I would highly recommend her. I was very pleased with Jo-Anne’s mediation services. She was very approachable, very resourceful and very professional. I will recommend her to friends and family who might need her expertise. Thank you so much Jo-Anne for everything you did for me and my family. I highly recommend Jo-Anne Moore who worked very hard in helping me deal with a very difficult family issue. Can't say enough good things about Jo-Anne. I was referred to Jo-Anne by a friend, while i was facing an impending separation (and eventual divorce). Jo-Anne was very professional, compassionate, and strategic throughout the whole process. She provided informative options at every step; and her guidance and advice led me thru a smooth separation process (including a separation agreement and custody agreement that i could feel at ease about). Jo-Anne is detailed oriented, and her billing transparency also made the process easier during a difficult time. I would definitely recommend Jo-Anne to any of my friends or colleagues. Thank you again for all you've done for my daughter and I.
Jo-Anne has shown empathy since the first moment we spoke. She made me feel comfortable opening up about my situation. With her, a very difficult path seemed like it could be overcome. She talked me through every step during the whole process, and made sure I understood what was going on, and what would happen next. Jo-Anne's dedication to my case was simply amazing. With her help and recommendations, I was able to successfully get shared physical custody of both my children. I am so blessed to have had crossed paths with her. She is very knowledgeable, prompt, and paid close attention to detail. I absolutely would recommend her services to anyone who seeks help with custody agreements or mediation. Thank you, Jo-Anne, for everything you have done to help bring my family back together.